This is probably the most well known fresh chile outside of Mexico. It is extremely popular inside the country as well. It looks a bit similar to the Serrano chile, and can be used interchangeably, thus they are many times confused. They are both dark green, with a shine to them, and carry a small and thin darker stem. 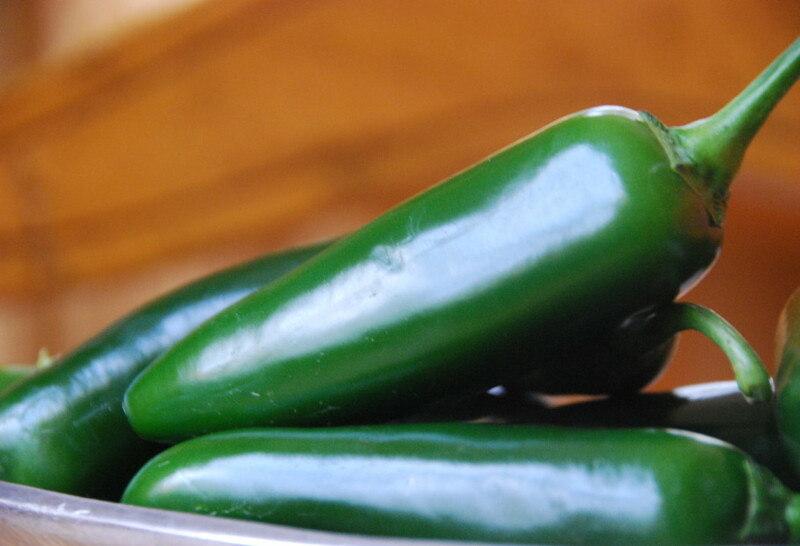 However, the Jalapeño is larger, bigger, rounder and chubbier than the Serrano. Ironically, it is milder in heat and has a lighter taste. Just as most fresh chiles, its heat can be pumped down by removing the seeds and veins. Similarly as other fresh chiles, don’t buy them if they have wrinkled skin or dark brown or black spots. The Jalapeño is eaten in thousands of different ways. But one of the dearest to Mexicans, is when they are pickled in a mix of vinegar and spices. Pickled Jalapeños are used as a delicious and lively garnish in tortas, sandwiches and quesadillas, to name a few dishes. They are also placed in bowls in table centers in restaurants and homes to nibble with bread or tortillas… or simply to accompany almost anything except dessert. Pickled Jalapeños can be homemade or storebought. There is a wide variety of brands that carry this product. In any case, either made at home or bought in cans, they can be absolutely delicious. In one of your shows you mentioned that there are different chiles that can always be cooked together, but others that you never cook together. Could you please send a list of the specific chiles on each list? I would really appreciate it. I have grilled different chiles and then put them in the freezer for quick additions to various dishes. Sometimes I add several different kinds. So, now that you have mentioned this in your show, I am curious if I have been combining the right chiles. Thanks. Love your show.